The huge amount spent on bringing the 2012 Olympics to London (£9 billion, no less) as least seemed justified in terms of the atmosphere and feel-good factor evident at the Anniversary Games this weekend. A lasting legacy was the ultimate aim and a capacity crowd was certainly keeping the Olympic flame alive as the world's best athletes converged on the English capital for this extra-special event. 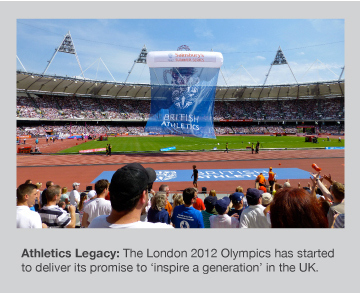 British superstars such as Mo Farah and Jessica Ennis-Hill have already played an enormous part in getting youngsters involved in the wonderful sport of athletics through their gold medal-winning exploits at London 2012. Their appearances within the Olympic Stadium were greeted with tumultuous roars and frantic waving of union jack flags - Britain has a rejuvenated passion for athletics that created an unforgettable couple of days for all those lucky enough to witness the drama unfolding before them. Many people will argue that these vast sums of money could have been better spent elsewhere however there is no price on a nation being uplifted and being given a sense of pride like this... it was electric. So long as schools, community groups, clubs and organisations continue to work tirelessly to engage with the stars of tomorrow through sport, the future looks incredibly bright - especially for British athletics.